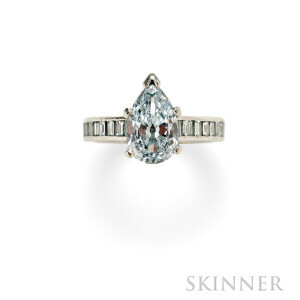 Skinner Fine Jewelry Auction Brings $10.75 Million | Skinner Inc.
BOSTON, MA – December 10, 2015 – Enthusiastic bidders from four continents competed online, by telephone, and in the gallery for the top lots at Skinner’s Fine Jewelry auction on December 8th in Boston. When the dust had settled, the sale had brought $10.75 million, with almost all of the top lots far exceeding their pre-sale estimates. Previews in New York and Boston in the days before the sale generated tremendous excitement, as interested collectors took advantage of the opportunity to view the fine jewelry on offer in person. Many of the standout lots in yesterday’s sale came from the estate of a member of a prominent Gilded Age New England family. Amid rampant speculation that the jewels were once owned by the French royal family, bidders were eager to acquire such beautiful and potentially historically important items. The highlight, of both the collection and the sale, was the final lot, a 31.25 cts. 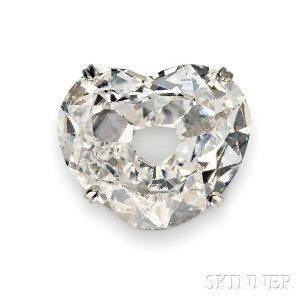 Heart-shape Diamond (Lot 498, Estimate $2,000,000-$3,000,000), certified as D color, VVS2 clarity, which sold for $3,947,000. (Prices realized for all lots include the buyer’s premium.) The stone is identified as a rare Type IIA, which places it among the world’s famous diamonds including the Cullinan, the Koh-i-Noor, and the Krupp. 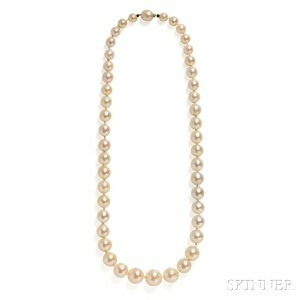 Another exceptional lot from the same consignment, an important Natural Pearl Necklace described by the Swiss Gemological Institute as “rare and exceptional” (Lot 493, Estimate $400,000-$600,000), sold for more than three times its presale estimate at $2,211,000. Other highlights included a 4.07 cts. Unmounted Diamond, also a Type IIa (Lot 494), which realized $165,000; the associated Antique Diamond Pendant (Lot 494A), sold for $104,550; and a companion Platinum and Diamond Riviere (Lot 495), sold for $123,000. Colored stones reached astounding per carat prices in the auction. A Colombian Emerald set within an Edwardian Brooch (Lot 489, Estimate $50,000-$75,000) sold for $495,000, which is over $100,000 per carat for this remarkable emerald. A Kashmir sapphire (Lot 490 Estimate $80,000-$120,000) from another New England estate brought $375,000, an incredible $70,000 per carat. Diamond prices were also very strong. Six diamonds in the auction brought over $100,000. A Fancy Blue Diamond Solitaire weighing 2.65 cts. (Lot 476, Estimate $80,000-$120,000) sold for $543,000, almost five times its presale estimate. All prices realized are available at on the Skinner website. Skinner auctions draw international interest from buyers and consignors alike, with material regularly achieving record prices. The company’s auction and appraisal services focus on fine art, jewelry, furniture, and decorative arts from around the globe, as well as wine, fine musical instruments, rare books, Asian art, clocks, Judaica, and more. Monthly Skinner Discovery auctions feature a breadth of estate material. Widely regarded as one of the most trusted names in the business, Skinner appraisers have appeared on the PBS-TV series, Antiques Roadshow, since the show’s inception. Skinner has galleries in Boston and Marlborough, Massachusetts, as well as in New York City and Coral Gables, Florida, with bidders participating in person, by phone, and online. Join auctions live with SkinnerLive! and Bidsquare. For more information and to read our blog, visit the website at www.skinnerinc.com, find us on Facebook, or follow us on Twitter and Instagram. This entry was posted in News and tagged antique jewelry, art deco, blue diamond, boston auction, Cartier, diamond, diamond bracelet, diamond necklace, diamond ring, diamond solitaire, diamonds, Fine Jewelry, gems, gemstones, Gloria Lieberman, important diamond, jewelry, jewelry auction, natural pearls, pearls, Piaget, rare diamonds, skinner, Tiffany, tourmaline, Van Cleef & Arpels, Victoria Bratberg by Skinner. Bookmark the permalink.